Santos Hernandez was the most gifted and famous maker of flamenco guitars in the 20th century. His work on perfecting the design of the flamenco guitar helped establish it as a fine instrument, very different in character to the classical guitar. There are two basic ways in which the flamenco guitar differs from the classical guitar. The first is in the choice of woods to use, and the second is in the design and thickness of the component parts. The strutting in the flamenco guitar is usually kept quite simple, because the rather free, open, earthy sound is best achieved if the soundboard is not too controlled in how it vibrates. Santos Hernandez used seven fan struts, but no closing struts at the lower end of the guitar. The weight of the guitar is kept to a minimum by using a thin soundboard, and thin Cypress for the back and ribs (which is much lighter than Rosewood). 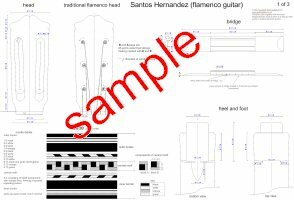 If you are planning to make your first Flamenco guitar, then this is the ideal model to follow.